We just learned about the Southern Sand Octopus. Another type of cephalopod is the Humboldt Squid, also known as the jumbo squid, jumbo flying squid, pota, or diablo rojo (red devil). These squid can gro from 5 feet to 8 feet long, they live in the Pacific Ocean, and usually live around 1,000 feet under the water. Just like some other cephalopods, they can change colors from white to red, which is where they get the nickname "red devil". Sometimes these squids will talk to other nearby squids by flashing different colors! This squid is a hunter, and when it is hunting other small fish it uses all of its 8 arms and 2 tentacles to reach out and grab the smaller fish or other animals it is hunting, then pull them into its mouth where it has a sharp beak used to cut up and eat the animals. They are super fast hunters and can swim up to 15 miles per hour! 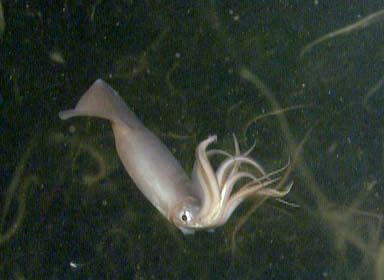 Some people have been attacked by this type of squid, but scientists think that only happens when the squid are feeding on other prey and are hunting. When these squid get angry they have even attacked and broken deep sea cameras sent down to look at nature.